Jerwin Ancajas has a 24-1-1 record, with 16 KOs. He’s currently on an 11-fight winning streak and has not lost since 2012. JERWIN Ancajas hopes to succeed where King Arthur Villanueva failed before. The 24-year-old Ancajas braces for the biggest fight of his life when he battles reigning champion McJoe Arroyo for the International Boxing Federation (IBF) junior bantamweight title on Saturday night at the Philippine Marine Corp gymnasium in Taguig City. Both the champion and challenger made weight during the official weigh-in on Friday. The Filipino southpaw came in at exactly the 115-lb. limit, while the unbeaten Arroyo tipped in at 114 lbs. Arroyo will be making the first defense of the title he won last year with a 10th-round technical decision over Villanueva in El Paso, Texas. The Puerto Rican champ, who has a fighting twin brother in McWilliams Arroyo, is unbeaten in 17 fights with eight coming by way of knockouts. 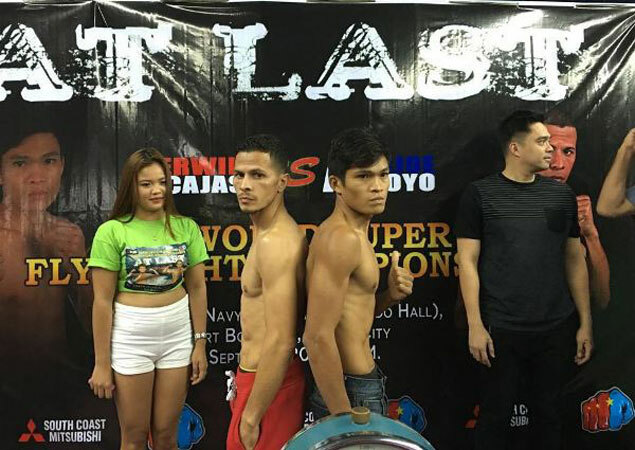 But the Filipino challenger is hardly unfazed by the overwhelming odds, confident he can wrest the title belt by the end of the 12-round bout. Ancajas has a 24-1-1 record, with 16 KOs. He’s currently on an 11-fight winning streak and has not lost since 2012. He will be attempting to become the country’s fourth world champion after Nonito Donaire Jr., Marlon Tapales, and Johnriel Casimero.